This perfectly matches a Nautica bed set I just bought. Great quality. Great length. Love it! Add the perfect finishing touch to your modern bedroom with this handsome Nautica bedskirt. 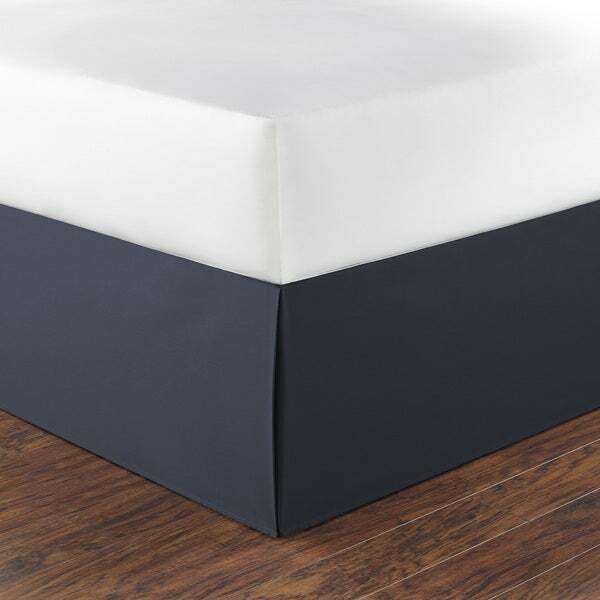 Crafted from 100-percent cotton twill in a crisp, navy blue, the bedskirt features a straight, split corner design that allows for a sleek and streamlined look. The machine washable bedskirt features a 15-inch drop length. Matches my Ink+Ivy Alpine 3-piece Cotton Duvet Cover Set perfectly The Duvet Cover didn't come with a bed skirt and the Nautica Navy Cotton 15-inch Drop Bedskirt was the ticket. Purchased this bedskirt as I didn't have time to make one myself. I thought since the brand was Nautica and the price was above what other cotten bedskirts were selling for-that this one might be of higher quality and sewn better, However, I was completely wrong for thinking this. The bedskirt was poorly sewn and along the long panel, the seam wasn't even straight. In the middle, there was a drop (curve) about an inch longer than the rest of the panel. Spent quite some time pressing the bedskirt and cutting off long strings that were EVERYWHERE! Guess I shouldn't be surprised as the item is Made in China. About the only thing this bedskirt has going for it is the dark navy color, which seems true to dark navy and did match the Nautica spread I already owned very closely. I am very pleased with this bedskirt. I bought a queen and put it on today. The drop is perfect - goes to the floor but does not pool. The corners are covered nicely and despite some tugging when I was putting it on, the mesh/fabroc in the center didn't rip. I took it out of the package and put it on the bed -- no ironing. There are a couple fold marks but overall, it looks great. ordered a Nautica duvet and needed a bedskirt to go with it. This was great! This bedskirt is great - fits perfectly. Very pleased. This is a good dark blue, nicely structured, fits the queen size bed well, and not thin material. Of course it did need ironing before putting on the bed. Bedskirt fit the king size bed perfectly and was folded in a way that it did not need to be ironed before putting it on. Huge plus! This is a basic bed skirt. The material is light weight and the corners could have more of an overlap of the material. Just okay. I can't believe that other people didn't need to iron theirs!!! Mine came in a small pkg and it had many folds in it...oh well...makes it look better. It's a thinner fabric than I thought. Picture is true to color. Overall, I'm happy with it. "I need to confirm that thesis a twin extra long (80")." I bought my bed skirt for a full bed not a twin bed it fits the full bed fine. Twin is 39 x 75.